Bowling is a sport where, occasionally, amateurs perform as well as the pros. With a little training, even the beginner can improve his or her score. Below tips are mainly designed for the bowler who does not have a hook on their ball, and whose ball is dropped in the center of the lane. Bowl with different weight balls at the bowling alley until you find the weight that feels right. If you bowl three games in a row, and you are a novice, by the third game your ball may start to feel a bit heavy. This is normal! Having your own ball can increase your score because it is made just for you. In other words, it provides consistency. The finger holes will be drilled to the right size specifications, and in the proper places. This will keep your hand properly angled for launching the ball. Bowling shoes can help your score because they will fit right and offer the proper amount of slide. And, you won't slide out of them! Shoes provided by the alley may be too slick, and you may slip, or they may have too much friction, impeding your natural slide. Again, check the discount stores for the best prices. Once you own a ball and shoes, you'll need a bag to hold these items. The placement of your feet at the start of the lane will impact where the ball goes. You will need to experiment with the proper place to stand. If you are doing well, take notice of where you are standing and stand in the same spot each time. Lanes are marked so that you can do this. If you are right handed, step with your right foot first as you go down the lane. End with your left foot as you release the ball. This will assure proper balance. If this is taking time to get used to, walk it slowly and release the ball. Practice at home with an imaginary ball. Eventually, you will get it, and it will be worth the practice. 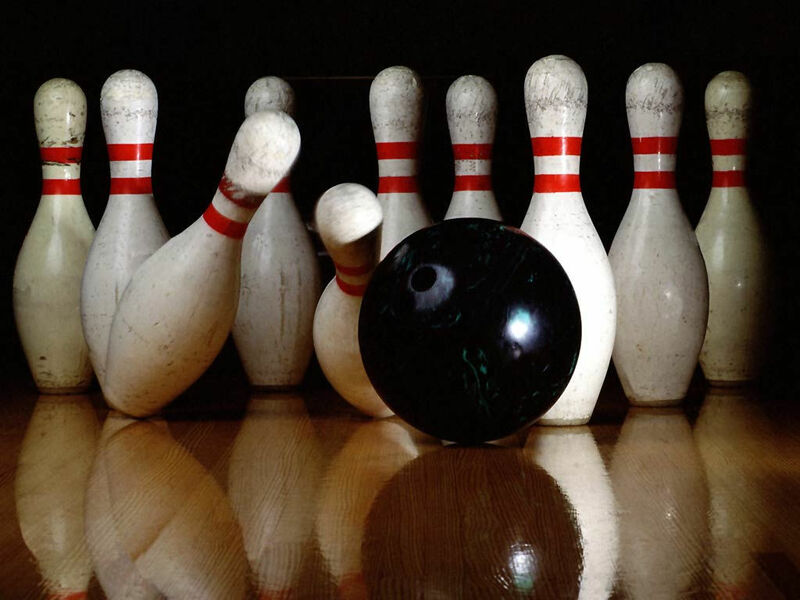 Some people report a higher score of 10 pins or more just by using a proper stride. As you are looking at the pins, before you start your stride, take aim. On the first ball, when all ten pins are lined up, many people look at the arrows painted on the lane rather than looking at the pins. There is a set of arrows painted on the lane beyond where you release the ball. Look at the closest set of arrows and pick one. Tell yourself that you just have to get the ball to the desired arrow. Some people choose the middle arrow; while others choose one to the left or right. It will depend on how straight your ball is and whether it curves. You want the ball to hit the pins at the pocket, which is the space between the head pin and the one next to it on the left or right. If it hits dead in the middle of the head pin, chances are you will end up with a split! Taking aim is different for the second ball. While many people aim for arrows in the first ball, they may aim for the actual pin in the second ball. If you do this, do not take your eyes off the pin from the time you begin your stride until after you release the ball. Chances are, your ball will follow your eyes. If you have just the corner pin left, and you are a novice bowler, you may have a tendency to want to throw straight down the lane. This is a good habit to break for a few reasons. One is that it is too close to the gutter so the ball may easily drop in the gutter. The second reason is that your ball may have a slight curve and it may turn away from the pin. Instead, learn to hit these corner pins by sending the ball across the alley. If aiming for the left corner pin, for example, stand far to the right, and aim your ball toward the middle. This will take practice, but eventually you will learn to hit that corner pin perfectly! As you release the ball, bend your knees as far as you possibly (and comfortably!) can. This puts you lower to the floor and can help control the ball. Many new bowlers make the mistake of turning their wrists, and their balls turn toward the gutter. Instead, try to keep your wrist as straight as possible. If you have a spare, you will get 10 points plus the next ball. Therefore, the next ball after a spare is very important. Try to knock down as many as possible. Concentrate and put into place your best bowling skills on these attempts. If you want your ball to curve, you will need it to be as dry as possible. The friction will help it curve. The bowling alleys are oiled, so the balls pick up oil as they roll down the lanes. To keep your ball dry, use a towel before each time you roll the ball. Dry the entire ball throughout the game. Bowling is a fun sport, gaining popularity with people of all ages. A bit of practice can send your score soaring!